Tomorrow, the New York Metropolitan Transportation Council, the regional planning body that coordinates transportation investments in New York City as well as Nassau, Suffolk, Westchester, Putnam, and Rockland counties, is set to adopt a slate of plans outlining the region’s transportation future. But according to the Tri-State Transportation Campaign, the assumptions underlying these plans rely on data that’s quickly becoming outdated. TSTC warns that regional planners could be setting the stage for big road projects instead of trying to curb traffic in and around NYC. NYMTC uses a complex model that crunches numbers on population, employment, transit service, road capacity, and other factors to derive its projections, which it updates every four years. The latest round of projections [PDF] show two encouraging signs: Transit ridership is expected to grow more quickly than driving, and driving is projected to grow more slowly than the population. By 2040, NYMTC projects a 13.4 percent population increase, a 12.3 percent increase in vehicle miles traveled, and a 20 percent jump in the number of transit trips. This is a change from the previous round of projections, which anticipated that increases in driving would outpace population growth. NYMTC projected in 2009 [PDF] that the regional population would grow 15 percent by 2035, while VMT was expected to grow slightly faster, at a 16 percent clip. A series of reports, most recently from U.S. PIRG, have called attention to the fact that the average American has been driving less and less each year since 2005. In New York state, driving per person has fallen 10.4 percent from its 2006 peak, a far bigger drop than NYMTC projects for the coming decades. 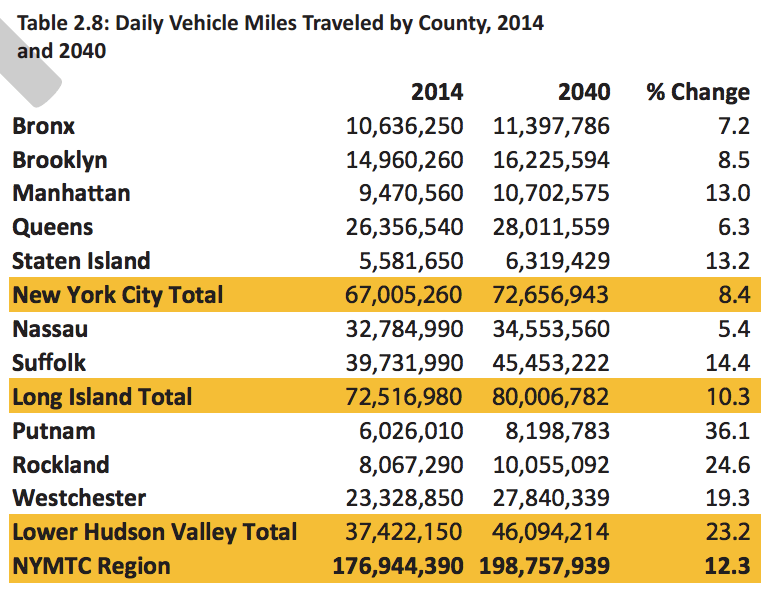 While acknowledging that its modest projected reduction in per capita driving “may indicate a correlation with national VMT trends,” NYMTC did not use the opportunity to publicly reassess its models. In fact, the agency discounted the stats showing a drop in VMT, saying that “the effects of the recession… and historically high gas prices should be taken into account,” even though compelling evidence indicates that the drop in driving is not strongly linked to the economic downturn. In July, Tri-State submitted its comments on the plan [PDF], saying that NYMTC’s VMT projections were too high and its transit projections too low in the face of new trends documented across the nation over the past decade. Lynch said that just because New York already has a strong transit network doesn’t mean it can’t continue to shift trips away from automobiles. “There is ample room for growth, particularly as transit-oriented development takes hold on Long Island and the Hudson Valley,” he said, citing East Side Access, the LIRR third track project, and potential bus rapid transit routes. Tri-State also asked NYMTC to include VMT reduction as a specific goal in its plans. The council rejected this request, saying that the plan already called for expanded road pricing and demand management programs to reduce congestion and pollution. “A logical result of these outcomes and actions would be a reduction in the growth of VMT,” NYMTC said. What’s missing from the equation is the effect of investment itself on transit usage and driving. These aren’t predetermined robots we’re talking about, they are people who make rational decisions. If you put all the money into increasing road capacity, driving will get faster and you’ll get more people driving than if you put that money into transit improvements. There is a good reason why more people drive in Houston than in NYC. It’s typically faster to take transit than to drive in NYC, and vice versa in Houston. These conditions are not random, they are a direct result of the land use and transportation decisions made in those cities. The planners are often the ones who are making those decisions, but they make it seem like they have no impact on the outcome, which is just plain wrong. Which is basically what we did from 1940 – 2000, and to a large extent still do (low gas tax, free highways, minimum parking requirements, etc, etc.). Interesting. A link to the LaGuardia point? A good article for Streeetsblog (that you could write, perhaps?) would be an account of how the NYC streets swelled for traffic at the expense of everything good in the city. Like, when 96th St, for example, was widened by narrowing the sidewalks and chopping down the trees that had shaded them, When the broad planted medians in Broadway and Park Ave were chopped down to create more lanes for traffic and parking. When 6th Ave and 7th Aves were bulldozed thru, knocking down all or parts of buildings from roughly Chambers St to 14th St. And so forth. And whodunnit. It wasn’t only LaGuardia. Robert Moses turned the quaint and curvy drives in Central Park into traffic sewers in the 1930s. It’s taken 50 years, since starting under Mayor Lindsay, to (almost) reverse that damage.